Here’s an easy Sunday dinner for you, perfect for when you want simple, flavorful foods without having to spend the whole day in the kitchen. This took me about 20-30 minutes to make, seriously. It’s healthy, gluten free, low fat and the leafy greens are low in calories and high on vitamins. 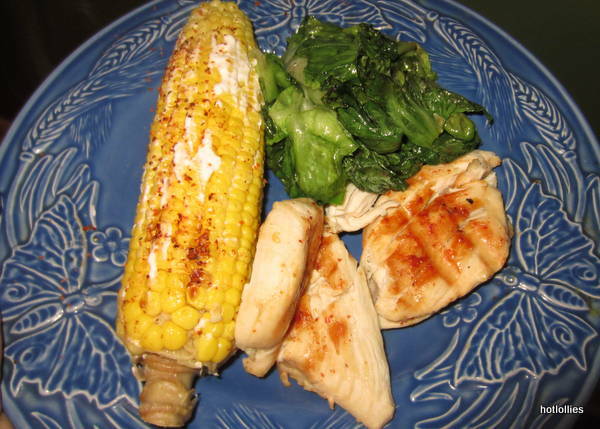 Oh, and the spicy corn on the cob, the kind you find at Mexican fairs, balances this dish on flavor. In Mexico they use crema but I didn’t have any so I used sour cream instead which is very similar. If you never had this spicy corn you have to try it. Simply out of this world! Happy Sunday and enjoy this glorious day!! 1. Season the chicken with with a mixture of chili salt. Grill the chicken until cooked all the way through. 2. Grill corn with or without husk. Grilling with husk makes it much more plump and juicy, just make sure to get rid of all the silk. Slather on the sour cream and sprinkle as much Tajin as you like. 3. Saute the escarole in butter and garlic with a little chili salt until wilted on medium heat. Remove from heat.